Rinaldo Piaggio founded the Rinaldo Piaggio SpA in Genoa, Italy in 1884. The company was renamed Piaggio & C. SpA (Piaggio) in 1887. Piaggio originally furnished ship interiors and manufactured railroad equipment but turned to the licensed construction of aircraft during World War I. Piaggio decided to manufacture aircraft of its own design in 1923. That same year, Piaggio purchased the Pegna-Bonmartini company and acquired the services of aeronautical engineer Giovanni Pegna. By the early 1930s, Piaggio looked to create military and commercial aircraft that incorporated modern advancements in design and manufacture. By 1932, Pegna had designed the Piaggio P.16 bomber. 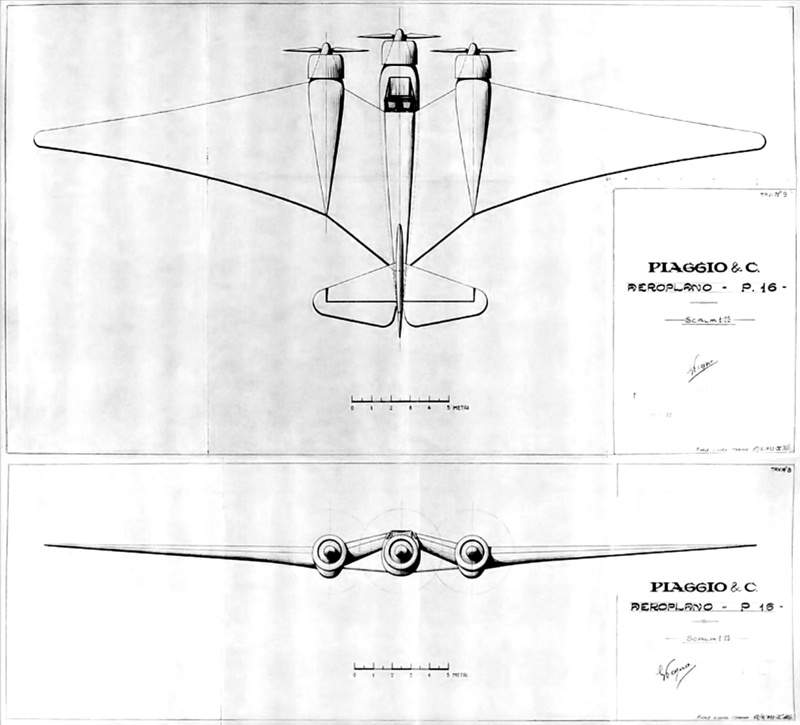 A circa 1932 drawing of the Piaggio P.16. Note the unique wing shape that was not used on the actual aircraft prototype. 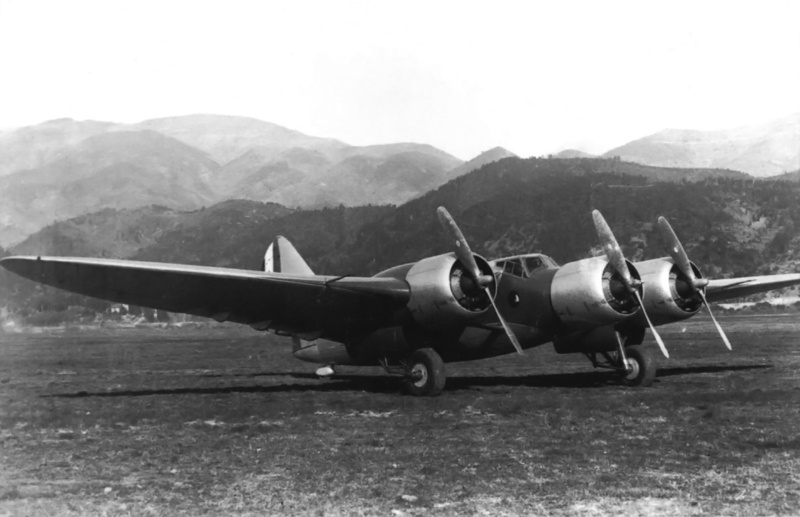 The P.16 possessed many features used for the first time on a Piaggio aircraft: tri-motor design, variable-pitch propellers, all metal construction, and retractable main landing gear. 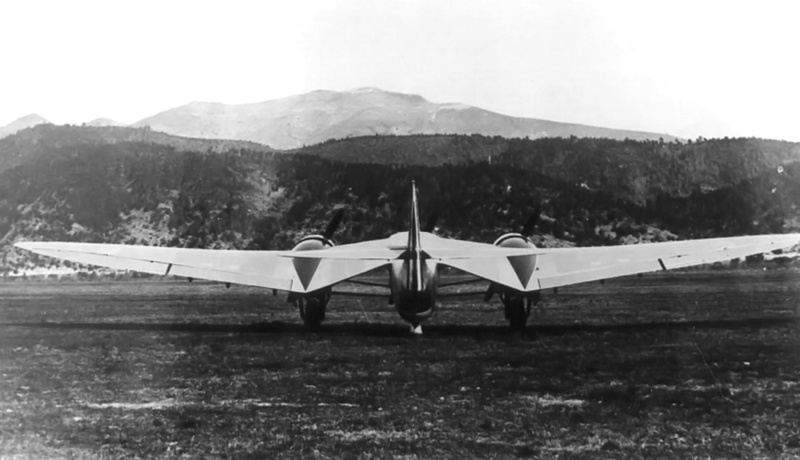 The P.16 was powered by three Piaggio P.IX RC engines—one in the nose of the aircraft and one on each wing. The P.IX RC engine was a nine-cylinder radial developed from the French Gnome-Rhône Mistral 9K. The engine displaced 1,517 cu in (24.9 L) and produced 610 hp (455 kW). The metal, two-blade propellers were developed by Corradino D’ Ascanio and built by Piaggio. The wings of the P.16 were of all duralumin construction, while the fuselage and tail had a steel tube frame. The front and upper sections of the fuselage were covered in duralumin. The aircraft’s control surfaces and the rear sides and lower sections of the fuselage were fabric-covered. The P.16’s original inverted gull wing design consisted of a very long wing root that ran from just behind the cockpit back to the tail. The wing continuously tapered toward its tip, which had a very narrow cord. The wing used on the actual aircraft maintained the same basic shape of the earlier design but extended back only to the middle of the aircraft’s fuselage and did not have such a narrow tip. The thickest part of the wing was by the engine nacelles, after which it narrowed toward the tip and toward the fuselage. The relatively thin wing roots helped reduce buffeting of the aircraft’s tail. The completed P.16 with its revised wing. Just below the cockpit side window is the circular window in the cockpit access door. On each side of the aircraft, two braces extended from the lower engine nacelle to the lower fuselage. Hydraulically operated flaps extended out from the engine nacelles to about mid-span, and ailerons occupied the rest of the wing’s trailing edge. The leading edge of the outer wing sections had retractable slats to improve the aircraft’s control at low-speed. The main landing gear retracted aft and was fully enclosed in the engine nacelles. The steerable tailwheel did not retract but was enclosed in an aerodynamic fairing. The P.16 had a five-man crew. The pilot and copilot sat side-by-side in the cockpit. Behind the cockpit was a bomb bay that accommodated 2,200 lb (1,000 kg) of bombs. Some sources indicate the bombardier was in the lower forward fuselage just below the cockpit. Other sources state the bombardier was behind the bomb bay in the middle of the aircraft. Given the aircraft’s layout, the mid-position seems more likely. Along the upper mid-fuselage was a retractable turret that housed one 7.7 mm machine gun. In the rear of the fuselage and just below the vertical stabilizer was another 7.7 mm machine gun position. Two additional 7.7 mm machine guns were forward firing. 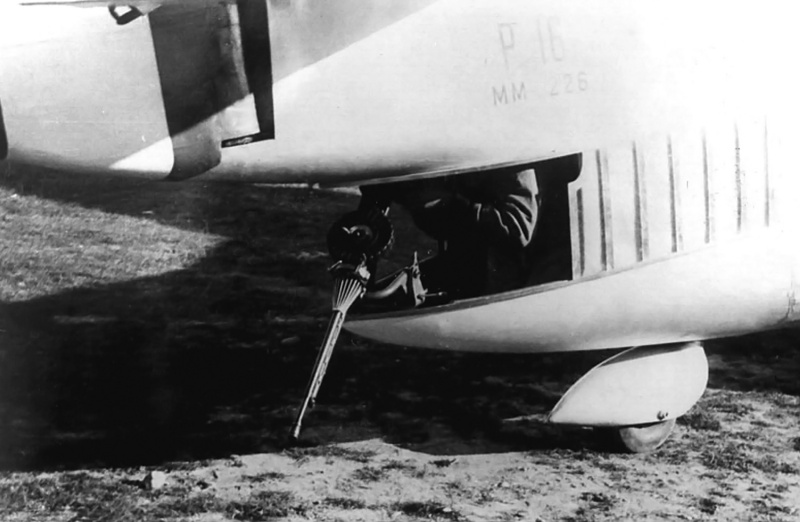 Most sources state the guns were located in the wing roots, but that would require the guns to be located right next to the cockpit and to fire through the propeller arc. It is possible that the forward firing machine guns were housed in the outer wing sections, but there is no obvious indication of their location. The distinct position of the rear gunner is illustrated in this side view of the P.16. The retracted dorsal turret can be seen just behind the wing root on the top of the fuselage. The cockpit was accessible by a door on each side of the aircraft, just under the cockpit side windows and in front of the wing. Another door just under the trailing edge of the left wing provided access to the rear fuselage. 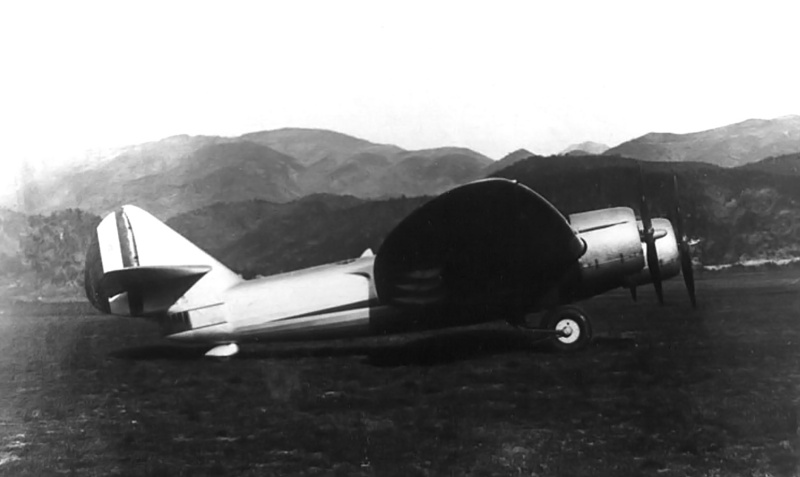 The P.16 had a wingspan of 72.2 ft (22.0 m) and was 44.0 ft (13.4 m) long. The aircraft’s empty weight was 12,346 lb (5,600 kg), and its loaded weight was 18,629 lb (8,450 kg). Its maximum speed was 224 mph (362 km/h) at sea level and 249 mph (400 km/h) at 16,404 ft (5,000 m). The aircraft had a cruising speed of 201 mph (324 km/h) and a landing speed of 65 mph (105 km/h). The P.16 could climb to 19,685 ft (6,000 m) in 17 minutes. The aircraft’s range was 932 miles (1,500 km) with a maximum bomb load and 1,243 miles (2,000 km) with a 1,100 lb (500 kg) bombload. This rear view of the P.16 shows the inverted gull wing and the struts running from the engine nacelles to the fuselage. Note the aircraft’s flaps and ailerons. The P.16 was officially ordered on 4 July 1933, but construction of the aircraft had already begun. The P.16 was given the serial number MM 226 and first flown in November 1934 at Villanova d’Albenga Airport with Mario Gamna at the controls. Starting in February 1935, the aircraft was evaluated by the Regia Aeronautica (Italian Royal Air Force). In October 1935, the P.16 made its public debut at the first Salone Internazionale Aeronautica (International Aviation Display) in Milan, where it attracted a lot of attention and interest. The Regia Aeronautica ordered 12 Piaggio P.16 aircraft, but this order was later cancelled in favor of the more promising (and conventional) Piaggio P.32, which was designed in 1935. While just one P.16 was built, the aircraft did help Piaggio learn the skills required to construct large, all-metal aircraft, which culminated with the Piaggio P.108 heavy bomber of World War II. A detailed view of the rear gunner position indicates firing above and directly behind the P.16 would be problematic. However, the gunner does have a good field of fire to the sides and below the aircraft. The P.16’s MM 226 serial number can be seen painted on the side of the aircraft. Note the tailwheel’s aerodynamic housing. This entry was posted in Aircraft, Between the Wars on 29 November 2015 by William Pearce. Does the rear turret have a sliding cover which would enclose it when not in use? What were the problems that led to the P.16 being cancelled in favour of the P.32? Yes, panels (the vertical lines) on each side of the rear turret could be slid closed. The P.32 was a better aircraft. It had basically the same range and speed as the P.16, but more payload. I think the P.32 would also have been easier to build, because it had only two engines and did not have the odd wing of the P.16. Even so, I don’t think the P.32 could be called a success. Only a few were built and they were withdrawn from service rather quickly.